If I take a picture, let the LG Camera app click (and sort of flash the screen), then immediately hit the Back button to exit the Camera app, the picture does not actually save. I noticed this the other day, and just tried reproducing it. Take a picture, letting the camera click and actually take the picture. But before the Gallery thumbnail in the bottom-right corner of the Camera app has a chance to update, immediately hit the Back button to exit. Then go to the Gallery and see if the picture is there. On my phone, it's as though I never took the picture at all. I have Verizon, on software 611A, and I am saving to the 32GB SD card from the LG promo. I have lost at least 1 picture already from this. It would seem to me that if the camera clicks, then the picture should officially have been taken, and the app should definitely save it before exiting, even if it has to finish the process in the background. If you take a picture on a normal digital camera, then immediately hit the power button, the camera will likely give a message like "Camera is busy", or something similar, preventing it from shutting down until it's finished. The only way I can reproduce this is if I hit the back button as the click is happening. Once the click is done of I immediately hit the back button, the picture is saved. I actually got a message saying 'saving..' one of the times I tried it. Pictures are saved to 64gb Samsung Evo card. I've just tried to reproduce this, both saving to the phone and to an external SD... if I exit before it shows up in the little bubble thing I get a "Saving..." message and the photo does save. If your photos are always taking a long time to save, then I would ask if they also take a long time to save to the phone instead of the external SD. I ask this because my photos always save very quickly (either instantaneously or within a second), even when saving to an external SD (Sandisk Extreme 64). Anyways, that's not what you were asking about. Thank you both for checking. I can also reproduce this when saving to the phone's internal storage. I'm waiting for the app to seem like it's finished taking the picture. The click is done, the screen "flash" is finished and back to normal, then I quickly hit Back. I'm doing this in Auto mode. I have never seen a "Saving" message when trying to exit, unfortunately. What carriers/models are you guys using? If someone can tell me how to check the version # of my Camera app, I'll check that, in case it helps. I'm using a Bell Canada version of the phone. Try clearing the cache of the camera app and doing a force stop of the app. I suspect your camera app is acting a lot slower than it should. Also try a reboot if you haven't done so in a while. I say this because I recently had the camera app freeze on me (it kept on showing me a viewfinder level thingy and then black-screening! ), and it wouldn't go away till I rebooted the phone. I was looking in the wrong place before; my Camera app version is 4.52.34.4. For anyone else, you have to go to Application Manager, then All (that is the part I missed), then scroll down to Camera. I did Clear Cache for the Camera app, then Force Stop, then rebooted. No change, unfortunately. I can still take a picture that is not actually saved. Is there a way to check for updates to the Camera app? I have the same version of the app and I'm on Sprint. Ok, so I'm able to reproduce and make this happen every single time if the flash is used. If I have the flash off, I can't reproduce it. So I did some quick testing. With the flash off, it takes 1 second or less for the picture to show up in the little preview circle on the screen after the sound of the picture finishes. When the flash is used, it takes 2-3 seconds for the picture to appear in the preview circle on the screen. Very weird. Does using the flash cause that much extra processing time? Edit: Did some further testing. I took 4 pictures in a semi dark room. 2 with flash off, 2 with flash on. The 2 pictures with the flash on had file sizes over 7MB where the flash off pictures were just over 6MB. Bingo! Thank you for discovering that! I hadn't given any thought to fact that the sample pictures I was taking were all using the flash (it's evening, and I'm indoors). I set the flash to Off, instead of Auto, and tried again. This time, as you guys found, I got a "Saving..." message, and the picture was in the gallery. So, sswitzer, could you try this again with the flash turned on? I tried setting the flash to On, instead of Auto, and I could again exit without the picture actually saving. I would say the Camera app has a bug when using the flash. There is no particular reason that I can think of that should make a flash picture harder to process, or which would excuse not giving the "Saving..." message while trying to exit. In my post above I edited to show an increased file size when using the flash. This makes sense in my mind, let me see if it does in words. Maybe the flash causes extra processing time, thus the higher file size. Even though it's just a 1MB difference, maybe that is enough for the processing to not be finished before exiting the app, so it just stops the process. When the 'saving...' comes up, the processing is done and it's actually saving to the SD card which has to be completed before the app exits. Interesting, I just tried taking a JPG + DNG (RAW) picture in Manual mode, with the flash forced on. It saved the picture despite my quickly hitting Back. A DNG file is around 20MB, plus the 7MB JPG in this case. So if file size, or file-writing time was the root of the problem, I'd expect this test would have lost the picture. But it didn't, it actually saved it. I didn't notice a "Saving..." message. Then I tried in Manual mode, just JPG, with the flash forced on. That also saved the picture. I don't think it gave a "Saving..." message. Simple mode, taking a picture which required the flash, did not save the picture when I exited quickly. So Auto and Simple modes, when using the flash, seem susceptible not actually saving the picture, if you hit Back quickly, to exit the Camera app. Yep, tested manual mode also and no issues with the picture saving. Even with flash on, the picture shows in the preview circle almost immediately, about as fast as auto mode with flash off. So maybe there is a bug of some sort in auto and simple. I just tried myself in auto and simple. Flash off: saves almost instantly. Flash on: it takes a good few seconds, and if you back out too quickly, it won't save. Oh geez, I didn't see that part in the original post about the flash. You didn't miss anything. I didn't mention the flash in the OP because I didn't realize that was part of the cause, until tourbound129 did some different testing and figured it out. I am able to reproduce the issue. Taking a picture with the camera app, and the flash, if you do not wait for it to explicitly say it is saved (or the picture to 'slide off screen') then it doesn't save. Really disappointing, as I lost a few good pictures because of this. Is there a process to report this to LG? Thank you for testing yours. What carrier do you have? I have reported this to LG, with a description of how to reproduce the problem, and a link to this thread. It's been a week since I last contacted them, I need to follow up again. Please contact their mobile phone tech support. I've used chat and email. The more people that report this, the more likely it is to be fixed. And the harder it is to say it's an isolated issue with one user's particular phone. If this affected many/all G4's, hypothetically, then that would make it even more important to fix. I am able to repro the problem with a flash photo using my ATT H810. If the camera uses a mechanical switch like many DSLRs do, turning off the camera before the save is completed will lose the photo. If the power switch is operated via software, then completing the save before the power is stopped is easy. There is no logical reason for the software-operated phone to not complete the save, foreground or background or whatever. Same results here, though on Verizon version. Do you think it's some kind of power usage thing, i.e. the power to fire the flash causes the phone to have to "catch up" to save the photo? Can't imagine the little LED uses much juice but just trying to think of a logical reason. I tried replicating this, but the camera saves the photo. 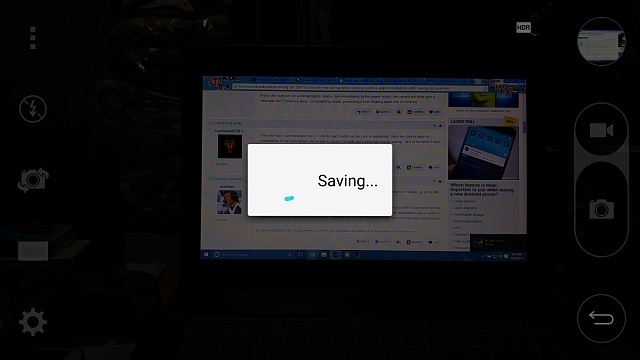 That's because, like on sswitzer's unit, mine says "Saving" before the camera app quits. I presume it's a possible bug with carrier-branded units. Did a bit more, and I actually managed to replicate the issue with the flash on. It saves if you exit after the screen flashes, but it doesn't when it just starts to flash. Thank you for re-testing, D13H4RD2L1V3. I was going to ask for clarification. It needs to be tested under certain conditions, as we figured out, after tourbound129 nailed it down. - Camera set to Auto mode (vs Simple or Manual). - Flash set to On (showing just the lightning bolt icon). - Take a picture, then immediately after the click and screen "flash", hit the Back button to exit the Camera app. Do this before the thumbnail in the lower-right corner has a chance to update. - Check the Gallery, and see if the new picture is in there. In my testing, the new picture will not be there. D13H4RD2L1V3, based on your testing, maybe for some devices, Back must be pressed while the screen "flash" is still happening. I can reliably make the picture fail to save. I haven't observed it being sensitive to when, exactly, I hit the Back button. I wait for the click and the screen "flash", then I hit Back. The important timing aspect that I've observed is simply hitting Back before the lower-right corner thumbnail has a chance to update. It's irregular for me, as it happens only when I exit when the screen just begins to flash. If I do so while it flashes, the picture saves. It's odd and while it's not a biggie for me since I don't use the flash often, I do hope that it can be fixed. I haven't missed any pictures because I never use flash but it could be an issue for many people who do. They may or may not fix it. I'm sure they know exactly why it's happening. Is there any way to retrieve photos from a Razor XT1080 when its water damaged and won't turn on? My texting stopped working properly after an update in May. How can I fix it? How can I locate my bookmarks in my Samsung Tab3Lite Kindle app? Why does ravensword shadowlands keep crashing and exiting?